Your mom always told you to keep your feet off the coffee table, but you’ll finally have good reason to listen to her advice with this wonderfully over-the-top Star Trek pinball machine sitting smack dab in the middle of your living room. 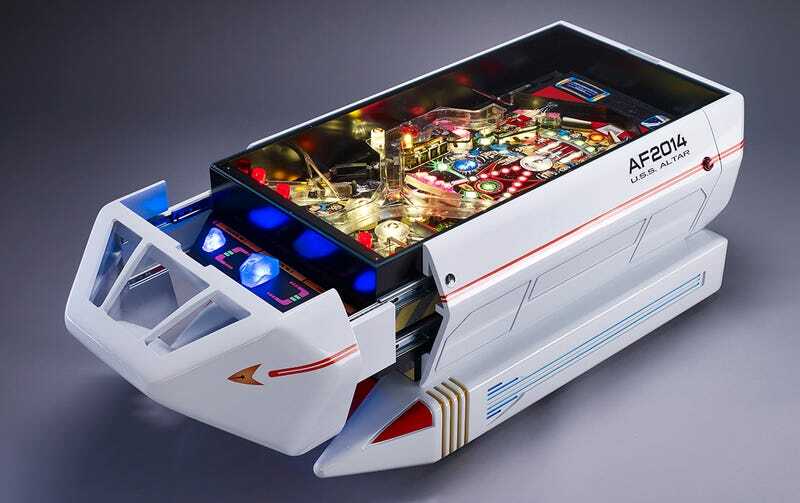 It started life as a legit Star Trek pinball machine built and sold by Data East back in 1991, but over the course of some 390 hours it was transformed into the beautifully-detailed coffee table that looks like a miniature shuttle craft landed in your living room. There’s even a secret pull-out compartment revealing a set of glowing dilithium crystals, and the pinball game itself is still fully playable, for those times when you can’t find a Star Trek rerun to watch. As for pricing, it’s one of those “if you have to ask you probably can’t afford it” type of collectibles, but you’re looking at around $15,000. However, who needs to buy a car or go anywhere when you have one of these in your home?